Imagine how your trading will improve because you are able to pinpoint the exact trigger point of entry or target? Built on new underlying algorithms it makes it even easier to identify potential imbalances between buyers and sellers. This is because it graphically shows the strongest supply and demand zones and how it performed in the past (showing old zones). These features were designed to help make it easier for you to find the best entry zones and levels. 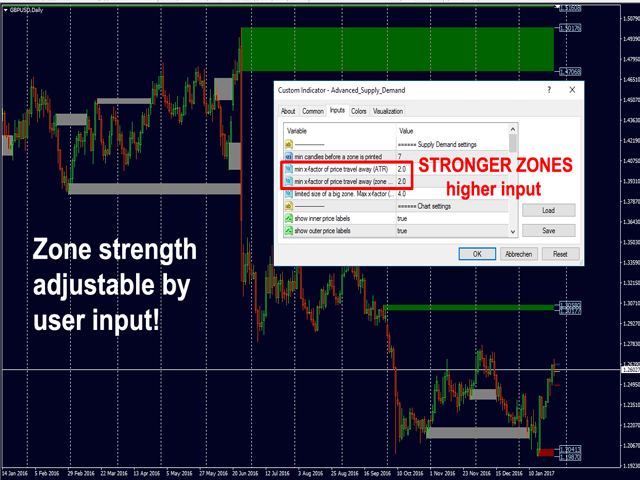 Now you can optimize and edit the zone strength for your symbol and timeframe! 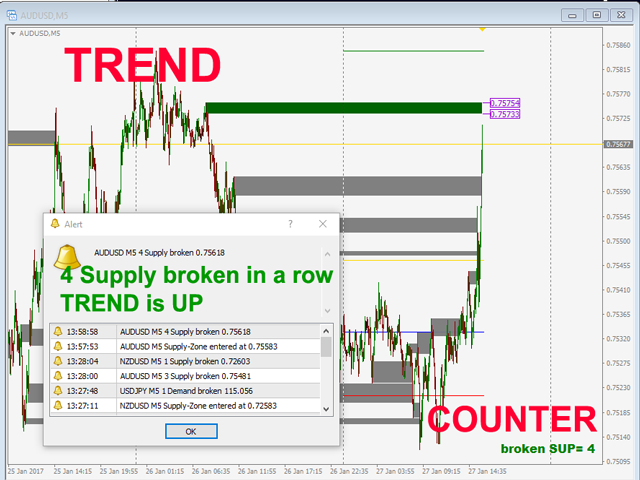 Advanced Supply Demand Indicator works on all products and timeframes. It is a new formula, and the very new features are two zone strength functions adjustable by user input! This is a great advantage in trading. When you learn how to use the proprietary features such as the zone strength with min X-factor of price travel away, you will be able to tell whether the zone is strong or not. 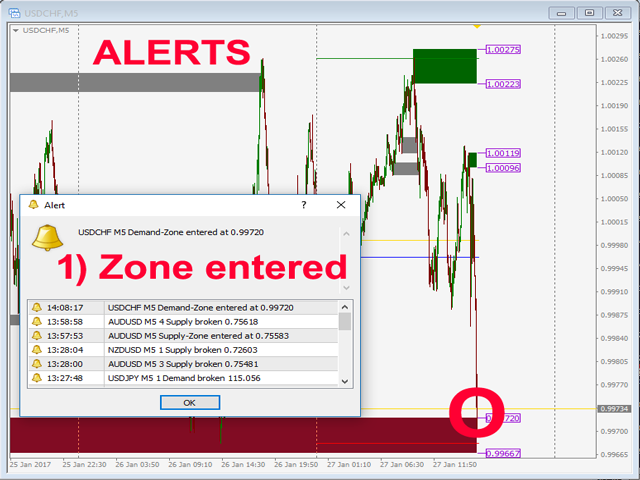 The supply and demand zones are used as an alert trigger. You have the choice of 3 alerts. If the price 1) enters the zone and/or 2) breaks the zone and/or 3) a reversal candle has formed from a zone. 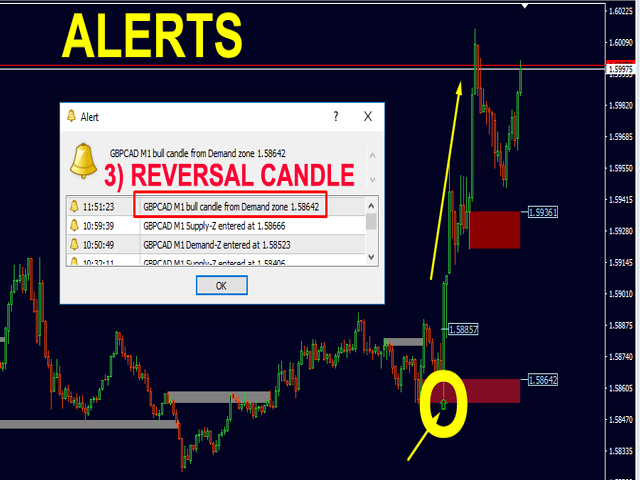 You can use popup alert with sound on MetaTrader 4 and/or push and/or email. When you will receive the alert you will know as a trader what to do. A message will tell you how many demand zones have been broken in a row, so you want to trade with the trend and look for a trend continuation. The indicator can detect nested S/D zones! A very powerful feature! The alert will tell if a S/D zone is nested (within) a higher timeframe S/D zone! All alerts can be filtered for nested zones. Min candles before a zone is printed (used for live chart). Min X-factor of price travel away (ATR) (The higher the number the stronger the zones). OPTIMIZE HERE FOR YOUR SYMBOL AND TIME FRAME! Min Y-factor of price travel away (zone size) 2nd Input: The higher the number the stronger the zones. OPTIMIZE HERE FOR YOUR SYMBOL AND TIME FRAME! Limited size of a big zone. Max factor (ATR) (Oversized big zones will be reduced. The higher the number the larger zones are allowed). Limited size of a big zone. Max factor (ATR) MTF (Oversized big zones will be reduced. The higher the number the larger zones are allowed). Show old zones (needed for Sup/Dem counter, see below). You know how to use it. Each zone has its own color. Use my template (See comments). 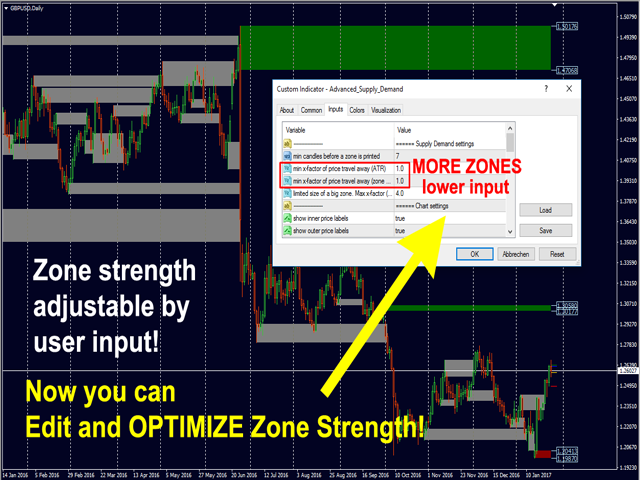 Optimize Zone Strength for your symbol and timeframe. Stay within the trend. The indicator is mostly used with one of my other specialized indicators of currency strength. Check my news and blogs on profile for trading system and trade examples. I will always help you if you have any questions. Thanks, I wish you many green pips in the future. very good indicator!!! great support.. I've been trading forex for just over 4 years when a short while ago I learned to trade supply and demand. I have never been this consistent before and knew from that point forward I would never turn back. When I discovered this indicator a short while ago I almost fell out of my chair. A 5 star product with 5 star support from Bernhard. When it is said "The best supply and demand indicator for Meta Trader on the market" that is no lie! I can't wait to add the other compononents one at a time in sequence after becoming proficient with each one. Great indicator with excellent support, Thanks Bernhard. This indicator helps me on better decision on TP and SL! Thank you for your hard work and bring us such good indicators. This is a very good indicator for resistance and support. Especially when you use the Multi Time Frame "Nesting" function on the same chart. Works very well to help decide which pairs to trade, take profit, stop loss, entries and exits. Works very well together with the Absolute Strength Currency28, where the supply and demand zones most of the time give you good information for your trading decisions. En väldigt bra indikator för motstånd och support. Jag har aldrig förut sett motstånd och stöd som fungerar så bra. SJälv använder jag indikatorn tillsammans med Absolute Strength Currency28 och de samverkar extremt bra. Yesterday 31st of December 2018 was my first time of using the Advanced D&S system along with my current trading strategy. With it, I was able to win 12 trades of 13 trades. I knew something like this existed and I have been looking for it for so long. I am still testing further and will drop more reviews soon. But so far, it makes my buying low and selling high ideally easy. i so love nested zones as it holds the success key to consistent profits..
With it, I was able to ride GA all the way up as well as GU up and down with over 200 pips in total on GU alone. This product is simply insane. I look forward to mastering the zones some more. Brilliant system, thorough study and patience required. The Advance Supply Demand in combination with Advance Currency Impluse/Alert and Advance Currency Strength28 gives excellent support to my Trading approach. The visual indication is real time and dependable. Support is outstanding. Would always recommend it. I trade using candlestick patterns and trendlines usually. I rented this indicator hoping to improve picking key Reversals and have to say ...i am impressed. On first day itself, it has made my Profits better and consistent, well atleast over last 12 trades. Will update after using it for few more weeks. But for now, Thanks to the Developer Bernhard for the excellent product. Hoping to buy the CS28 soon.. I have been using the Bernhard's Indicators (Dashboard, Volume, Strength, Impulse and Supply/Demand) for over a year and have increased my win/loss ratio dramatically. I am dumping everything else and focusing on this suite of indicators exclusively. THEY WORK. Great products combined with great service and thorough documentation. 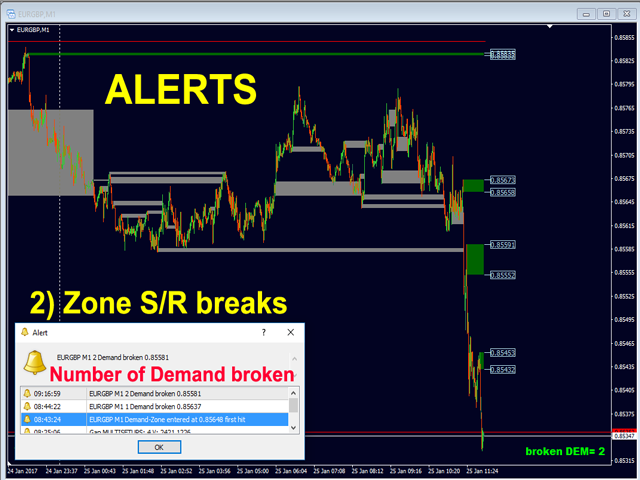 This is one of the best Indicators on MQL5 community for Supply&Demand traders. It has Alerts,too. I stumbled upon Bernhard indicators while searching MQL5 market. I read the theory behind the setup and the trade examples. Firstly I rented CS28 and right away started to use it on my live account. I can say that this was a right decision I had taken. After CS28 I also rented impulse speed, supply and demand and dashboard indicators. These indicators complement each other and give you confidence when you initiate a trade. It might look difficult but if you go through the trade examples Bernhard has posted you will learn a lot. After all Bernhard support is excellent. I think this is the best supply and demand zone indicator out there. Its formulated really accurate zones. Plus it can shows u higher tf zones. Great indicators and excellent support from Bernhard! The combination with the ACS28, Impulse Alert and Supply and Demand makes it an unbeatable system for the trade. Thank you very much Bernhard!! With this Indicator, I have completed, for now, my Kit to attack the Market with the strategy: "28 Pairs Currency Strength with Impulse Trading System". It is a complement to this Strategy, however, it is more independent. It is an Indicator that can be used in any strategy, as long as you want to see where the Supply & Demand zones are. I have already used some Supply & Demand Indicators and this is by far the most complete. The fact that it is possible to present these zones in two Time Frames in the same window is a considerable advantage. I have rented ASD.It is very good indicator. Amazing! I also have rented ACI with alert and ACS28.The combination of those 3 indicators is very useful and accurate. I'm glad I rented it out along with S&D and Impulse. This one is my favourite, because you see the best spot! The value of this indicator lies in the identification of target zones. It helps add confidence to entries and exits and when combined with Bernhard's Impulse and Strength indicators, it makes for a very powerful Trading System. Bernhard has put a lot of work into design and refining and is to be congratulated on his achievements. Good indicator after you master this system. Great indicator, great documentation and excellent support from Bernhard! The multi-time frame and the nested zones will give your a real advantage. Now i can see clearly the strong zones for better entries or take profits. Thank you Bernhard, very good job ! absolute GAME CHANGER! I wish i discovered this when i first started trading! Ich habe zuerst Advanced Supply Demand benutzt und seit dem muß ich mich nicht mehr um Wiederstände kümmern in mein Handelssystem. Ich habe darauf Advanced Currency Strength28 Indicator und Adveanced Currency Impulse w. alert hinzu genommen und sehe jetzt wo meine Problem von meinen EA`s waren. Den DAX und Dow kann man mit dem Advanced Supply Demand auch sehr gut handeln falls es einen interessiert. Zusammen bilden Sie ein sehr gutes System! I used Advanced Supply Demand first, and since then I no longer have to worry about the odds in my trading system. I have Advanced Currency Strength28 Indicator and Adveanced Currency Impulse w. Alert added and now see where my problem of my EA's were. The DAX and Dow can also do very well with the Advanced Supply Demand if they are interested. Together they make a very good system! Excellent indicator and Bernards support is great too! Very good Indicator, Good support. This was the first indicator I bought and tested. I did my own chart analysis for sup/dem zones and I asked my trading friends to send theirs to me as well so I could compare to the indicator. The indicator was spot on. The other part that I really like is the alerts. I no longer have to pay Trading View!!! Thanks Bernhard. He is a very accurate foreign exchange indicator, you can use it with confidence. Great Indicator. I'm using Advanced Supply Demand, Impulse and Strength28. Recommend using all 3 of them. Fantastic tool for seeing the key levels / areas and it is extremely reliable and useful for either looking for trades within those zones or for taking profits. Don't like to trade without it. Nice indicator. 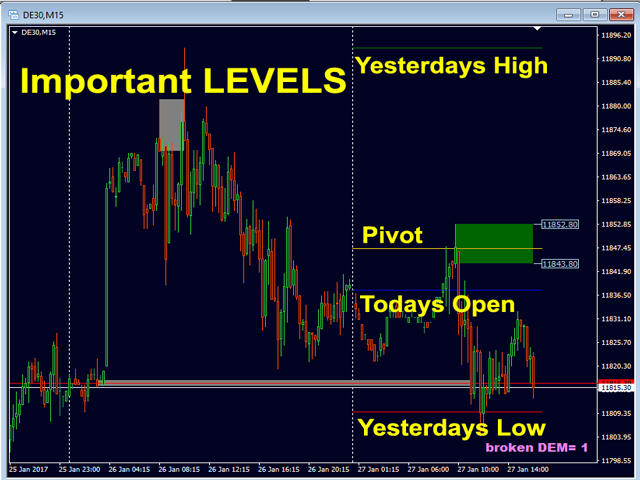 Shows important price levels/zones, and helps to determine profit targets and stop losses. Support is very nice. Supply and demand folks, not support and resistance! ;D This indicator is the embodiment of Bernhard's philosophy from my pov. It covers one of the most important topics in trading - profit targets, stop losses, win/lose ratio. The flexibility to trade your style but also to adapt according market conditions. It works on any timeframe! I prefer putting profit targets exactly one tick below or above my second timeframe box (h4), best for daytraders. Mark my words: On most days the rate reaches these targets - for the first time(! ), it reverses right at the stroke of the box. I never made any change on the settings, except playing with the timeframe. I am a newbie in the forex and I tested a lot of indicators and I am on the side of losses trade ! Bernhard answered my questions even if everything was already explained in the blog! I again asked Bernhard who answered by mail several times, quickly and courteously knowing that everything was already explained many times! what patience ! in the end I read the post, download the photos of explanations and now I understand all the interest of these visual tools and I even reintegrated dashboard! i am french, retired and as you see my english could be better ! I would say "Please! 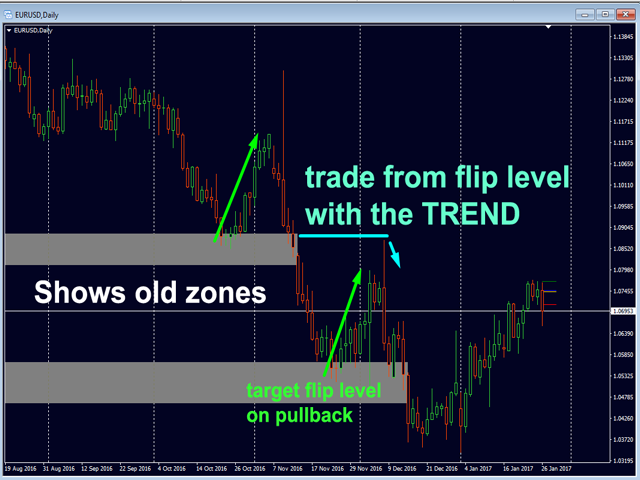 Get this indicator to complete your trading system". You won't believe this until you have one. This is supply & demand zone, not a simple support and resistance. The best part, it is automated and support multi timeframe. Thanks to Mr. Bernhard for developing such system. Hopefully, you will offer us discount for yearly renewal. The demand and supply levels on this indicator are excellent. Helps me with my SL/TP levels and I have gotten out of so many trades that I thought would go further but hit the levels and reversed. Excellent indicator. Support and resistance zones are obviously important for forex. I don't like to spend time manually drawing zones/or visualising myself. This indicator is great and you can base a number of strategies off it, for instance bet on prices re-visiting the zones, bet on prices moving away further from new zones etc. Additionally Bernhards support is second to none. He's always there to lend a helping hand. Great support and well coded excellent product, definitely deserve 5 stars. Ich nutze vier Produkte von Bernhard in Kombination und habe fast alle anderen Indikatoren,die ich in nahezu 30 Jahren Trading "sammelte", deinstalliert. Ich kann nur jedem Trader empfehlen, der dieses Business ernsthaft betreiben will, sich mit seinen Produkten auseinanderzusetzen. Auch die schnelle Hilfsbereitschaft von Bernhard sind deutlich hervorzuheben und sehr selten anzutreffen, nachdem jemand sein Produkt verkauft oder verleast hat. Just perfect if you keep to all the published rules. Amazing! Definitely, a tool you must have. I love the Multi-Time Frame function with the nested zones! Don't Diddle in the Middle! This tool paid for its self within a short time and it has already become part of my daily trading routine. Bernhard, Thank you for this unique product. It saved me a lot of time of manual charting! Also, the support from Bernhard is great. Optimized XY-filter for higher timeframe MTF. 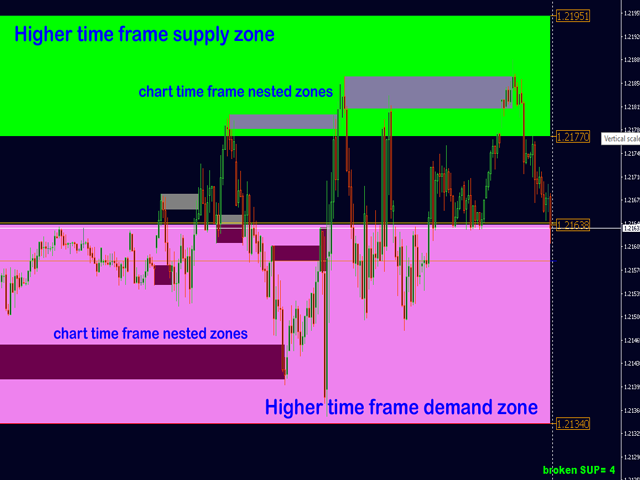 To make sure the higher timeframe filters out weak S/D zones the same way as the lower timeframe (chart) does. Also you can setup different values for each timeframe. It applies to all 3 actual alerts (hit - reverse - break). If turned off the alerts will still tell if the alerted zone was nested or not. Added an optional pause in seconds for less CPU use. (Set to 0 to turn it off) At least on each new candle new zones will be checked. Added a new visual option for higher timeframe zones rectangles. Added XY-filter for higher timeframe. Added pre-name for objects. 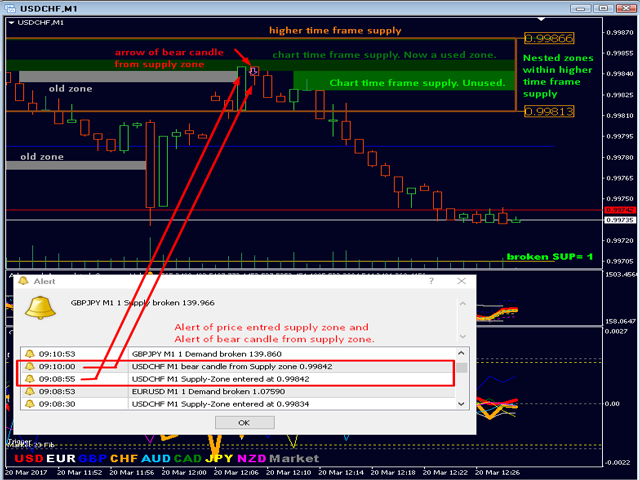 In case you want to use the indicator twice on a chart, enter here a letter for the 2nd. Final upgrade with faster calculations. It just got hypersonic speed to draw all levels and zones !!! Gives access to the first 5 supply and demand zones (outer price, inner price, if it is used or not, the timeframe, and the symbol). 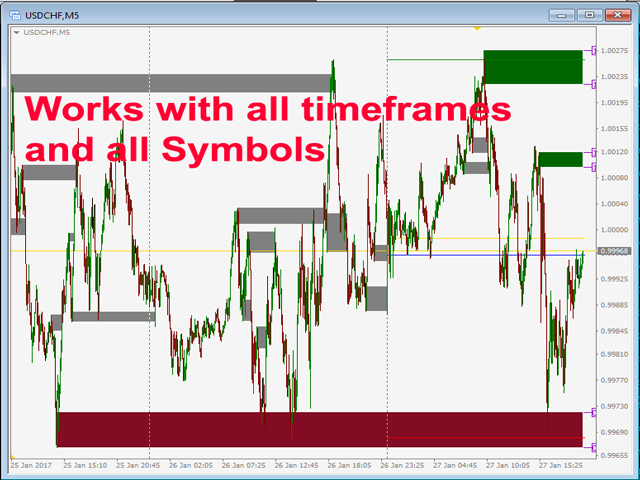 Added an input to draw the higher timeframe squares extended to the right to not cover the live candle. Minimized CPU usage with a timer. On customers request, I added different colors for broken (old) zones. Repeating alerts on M1 are been fixed. With this update, we have a small add for better graphic. Now you can choose empty squares for the higher timeframe (MTF) and edit the line width. This makes it graphically easier to differentiate between chart timeframe zones and higher timeframe zones. The colors have been modified for the higher TF to be more beautiful. With this update, you will be able to show double time frame zones. 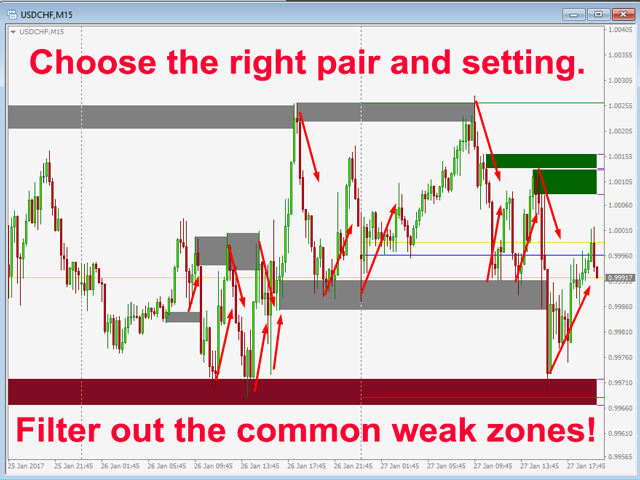 You will not only be able to show a higher TF but to show both, the chart TF, PLUS the higher TF: SHOWING NESTED ZONES. Corrected count of broken supply/demand zones and start of daily lines.